A year has passed since Soma Cruz discovered the evil of Dracula hidden inside of his body. Now, a mysterious cult wants to release the power of the lord of darkness. As Soma, you must do everything in your power to stop them before it's too late. - Draw the correct magic seal quickly, or your enemies will never die! - Fight and explore through one of the largest castles ever seen in the series! - Race another player through custom-made castle rooms in versus mode! 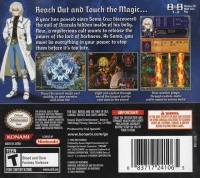 11-08-2018 agozer Box Text Reach Out and Touch the Magic... A year has passed since Soma Cruz discovered the evil of Dracula hidden inside of his body. Now, a mysterious cult wants to release the power of the lord of darkness. As Soma, you must do everything in your power to stop them before it's too late. - Draw the correct magic seal quickly, or your enemies will never die! - Fight and explore through one of the largest castles ever seen in the series! - Race another player through custom-made castle rooms in versus mode! 04-14-2016 mrfoxhound Box Text Reach Out and Touch the Magic... A year has passed since Soma Cruz discovered the evil of Dracula hidden inside of his body. Now, a mysterious cult wants to release the power of the lord of darkness. As Soma, you must do everything in your power to stop them before it's too late. - Draw the correct magic seal quickly, or your enemies will never die! - Fight and explore through one of the largest castles ever seen in the series! - Race another player through custom-made castle rooms in versus mode! 04-14-2016 mrfoxhound Box Text Reach Out and Touch the Magic... A year has passed since Soma Cruz discovered the evil of Dracula hidden inside of his body. Now, a mysterious cult wants to release the power of the lord of darkness. As Soma, you must do everything in your power to stop them before it's too late. 09-20-2011 scott Box Text Reach Out and Touch the Magic... A year has passed since Soma Cruz discovered the evil of Dracula hidden inside his body. Now, a mysterious cult wants to release the power of the lord of darkness. As Soma, you must do everything in your power to stop them before it's too late. 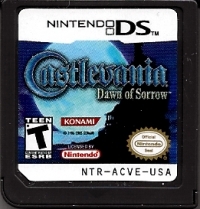 This is a list of VGCollect users who have Castlevania: Dawn of Sorrow in their Collection. This is a list of VGCollect users who have Castlevania: Dawn of Sorrow in their Sell List. 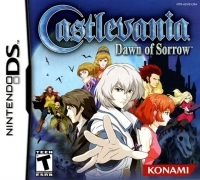 This is a list of VGCollect users who have Castlevania: Dawn of Sorrow in their Wish List.